A lot of educators struggle with teaching kids punctuation because they are a sort of “orphan” when it comes to reading instruction. Because so much emphasis is placed on phonics, teaching kids punctuation sometimes gets lost. As a result, for many children, the only punctuation you’ll see them use is a capital letter for the first word and a period placed after the last word. After that, it’s up for grabs. Punctuation, along with its companion visual cues of capital letters and spacing, captures key aspects of language that go beyond words themselves (such as posing a question, emphasizing an idea, pausing, and so on). The tools for representing this information (periods, question marks, exclamation points, etc.) 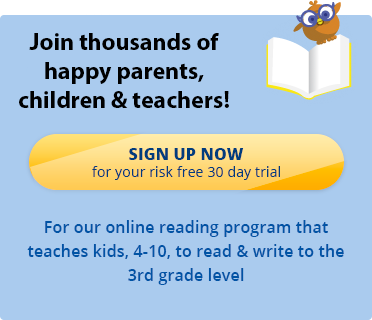 are generally not taught until the children are way past the initial stages of reading. This naturally leads them to ignore this realm. “Unlearning” is difficult. So when they are suddenly told to switch gears and attend to what they have been discounting, they have a hard time. A good way to help your child develop skill in this area is to carry out the activity outlined below. It can be started once your child is able to smoothly read several connected sentences in a book—regardless of the grade level of the content. 1. Select a book that your child can read easily. At the outset, avoid stories. Stories tend to have lots of dialogue and the punctuation surrounding dialogue (such as quotation marks) can prove tricky to a beginner. Information-based material (biographies, news articles, science books on plants, rocks, etc.) is generally best. 2. Start with single sentences—but make sure that there is some variety in the punctuation (so that every sentence does not end in a period). Make a copy of the sentence—but have it empty of capitals and punctuation (e.g., the man was walking in the snow). In addition, have the spacing of the words in your copy be different from the spacing of the words in the book (e.g., if, in the book, “walking” ends on one line and “in” starts on the next line, you can have “in” end on the line and “the” start the new line). Have several copies of your “unpunctuated” sentence available, each on a separate sheet of paper. 3. After telling your child that there is going to be a punctuation activity, ask him or her to read aloud the sentence in the book. Then close the book, show the “unpunctuated” copy and have your child enter the necessary information. 4. If there is an error or omission, remove the paper away, telling your child that there was a mistake and you need to start again. Do not tell your child what the error was. Simply show the original sentence again and repeat step 3. 5. Aim to do 5-6 sentences in a session. 6. You want to move beyond single sentences as quickly as possible. Once your child is performing at about 80% correct with single sentences, move on to two sentences and carry it out in the same manner as above. 7. Once two sentences are managed effectively, move up to short paragraphs of three to four sentences. Initially each paragraph should be dealt with separately. But as skill is gained, you can combine paragraphs. You ultimate goal is to have your child skilled in completing three sequenced paragraphs. At this level, he or she will have mastered the punctuation needed for any writing demanded in the curriculum and/or any extended writing he or she elects to do.